A long standing friend and supporter of this blog, Adam Matteson of Vero has compiled a list of the fires that have involved the Recycling Industry in 2018. We at LMI have been commissioned to assist Insured’s on a number of these fires, have conducted many risk management audits and I have addressed the Victorian Waste Management Association – but even with all this first hand knowledge I was surprised just how long the list is. There are a number of things that flow from this. First, it is not just the recycling business alone that is affected. 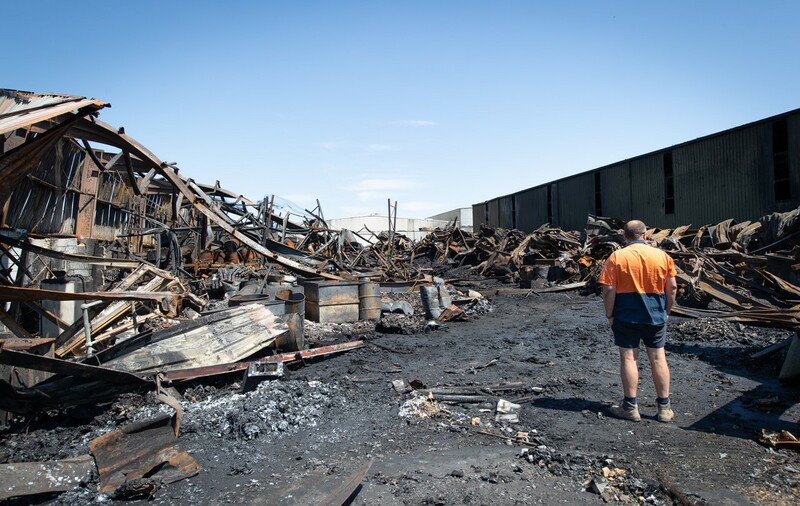 In the recent fire in Campbellfield for instance, significant damage and disruption has been caused to a great many businesses due to the fire that started in the recycling center. The damage to the environment and the subsequent cost of clean up can be quite significant. The frequency of fires in this one industry is clearly unsustainable for the insurance industry to keep funding the losses. Add to this the reported instances of massive amounts of chemicals being stored illegally. Clearly there needs to be tighter regulation and severe penalties to drive the cowboys out of this industry. As an aside, the storage of chemicals etc is often without the knowledge or approval of the landlords who may well, as the owner of the building and land may end up with the responsibility for the removal and disposal and may find that their own insurance is voided due to a mis-description as to the occupancy / trade of the tenant. The reality is that no prudent business person would operate without adequate insurance and if this industry does not improve its loss ratio and image then we will not have a recycling industry in this country as even the well run operations who are already struggling to compete on price with the cowboys will not be able to secure insurance and therefore not get finance and or place an unacceptable level of risk on the business owners/shareholders. All of us will ultimately suffer from this. Anyone who is serious about our environment and the world that we are going to leave our children and grandchildren want to see a cut back on carbon emissions and the amount of waste that is going to landfill. We need a well run professional industry that does the right thing by the environment, our communities and our economy. If this takes meaningful regulation that is properly enforced so be it. However, all of us have to accept that there is a cost to recycling and that we need to support and pay for the professional ones that do the right thing. The cost of insurance to these firms alone will go up by 100’s of percent if they can find an insurer and so their cost of operation will have to rise. We also have to do our bit to ensure that we do not add to the risk faced by recycling companies. We need to take particular care as to what we put in our household recycling for a start. Putting in things that may result in a fire starting needs to immediately stop. This is not only with our residential waste but at all levels. One story that was relayed to me was that during a risk survey at a company that recycles, a fiberglass boat was about to be cut up but it was found by the surveyor that the fuel tank had not been emptied and the safety flares were still in the boat. The person who disposed of the boat I think should have taken a bit more care while the recycling firm needed to introduce a system of a basic check of what is being recycled rather than blinding cutting up and crushing which would most likely have resulted in this case as yet another fire. Another example I was personally involved in is that a car wrecker crushed a car which had a number of pressure paint cans in the boot. These exploded and caused a fire when the car was crushed. A quick visual inspection of the car before crushing could have prevented this serious fire. Finally, recyclers can start rebuilding a relationship with the insurance industry by refusing to accept stolen metals which remains a serious issue in Australia with copper, brass and lead being stolen from unoccupied buildings. Thanks Adam for sharing this thought provoking list. It is very much appreciated.